Becoming a culinary arts instructor requires dedication to your art, a four-year degree from a college or online school, and a desire to teach others. Do you have a knack at creating delicious meals? Are you a natural in the kitchen? With the right education, you could become a culinary arts instructor and share your expertise with culinary arts students. Unlike being a chef instructor, a culinary arts instructor normally has a full four-year degree from a university or culinary arts school, with an emphasis on the teaching credentials and applications to the field. A chef instructor may sometimes hold only a certificate in the culinary arts. But culinary arts instructors tend to be slightly more specializes in their field, with more formal education behind them. The general requirements for a culinary arts instructor include a Bachelor’s degree or similar credentials from a culinary arts school, or a degree in Home Economics, if you wish to teach in a high school or public education setting. Most culinary arts instructors go on to work in college settings or other institutions of higher learning. Others may return to the school in which they received their degree to teach. You could also teach new chefs in well-established or even famous restaurants. But the setting will be determined by your own personal career goals and aspirations. 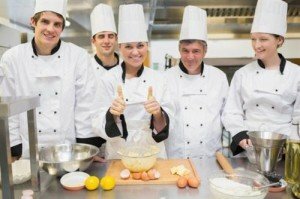 A typical education for a culinary arts instructor would be a degree from a school or online university in the area of culinary arts, cooking, or chef techniques. If you choose not to take the traditional route, you may be able to serve as a culinary arts instructor in some settings without the four-year or two-year degree. However, it is important to think about what your career goals are, and plan your education and training accordingly. 1) Enroll in an accredited culinary education program. To become a culinary arts instructor, you need to have the proper credentials. This usually includes a four-year degree from a culinary arts school. So get your education and training first from a source you can trust. Find a degree program which focuses on both the art of excellent cooking, health and safety in cooking, and education. 2) Become a master chef. Just as is true of anything, people will respect you more, and your credibility will improve if you are a master at what you teach. So focus on your own craft as a master chef, build a reputation, then seek out opportunities to teach others on the job. 3) Get recommendations from employers. If you have been an exceptional cook or chef, as you should be if you are wanting to instruct others in this field, ask for a sparkling recommendation from your former or current employer. This can go a long way toward building your reputation and getting a chance with more famous restaurants. 4) Gain teaching experience. Even if you have not taught in the culinary arts area before, any formal teaching experience which illustrates your ability to communicate information in a positive manner will be to your benefit. Even if your teaching experience is only local in a neighborhood school or church cooking bazaar, put it down. If you were ever a guest speaker in a high school Home Economics class, use this experience on your resume. It shows you took the initiative to work on your craft and have a desire to help others in the field as well. 5) Start your own cooking school. If you are the entrepreneurial type, instead of getting a job with a school or restaurant, you could start your own! If you have the funding and the initiative, consider starting your own cooking school. Create a video on You Tube about your abilities, illustrating your culinary prowess in the reel. Market your business both locally and nationally. You could also trademark a name and have your own restaurant. It is possible to build a whole brand around your specific type of cooking and culinary expertise, if you know what you are doing. Becoming a culinary arts instructor requires dedication to your art, a four-year degree from a college or online school, and a desire to teach others. Look into the ways you could become a culinary arts instructor, but always start with a school that offers excellent training first. Best wishes to you in your pursuit in a career in the art of cooking! My compliments to the chef!